I'd like to follow up on something I mentioned back in March: the "Finnegans Wake for Dummies" article in my first edition of the James Joyce Quarterly. In it, Professor Sebastien D.G. Knowles of Ohio State University describes a Finnegans Wake graduate seminar he put on after acknowledging the crisis that he (the author of a book on Joyce, attendee of two decades worth of Joyce seminars, and teacher of over a dozen courses on Joyce) had never read Finnegans Wake. 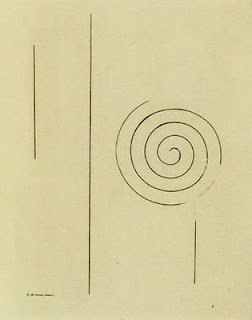 Inspired by Constantin Brancusi's "Symbol of Joyce" (shown above) he realized that the best way to read the Wake is to start in the middle and work your way out. After all, the book doesn't really follow a linear, chronological order---the "action" is timeless (and spaceless) and the book begins with a lowercase "riverrun" completing the final sentence of the book which ends with "the." 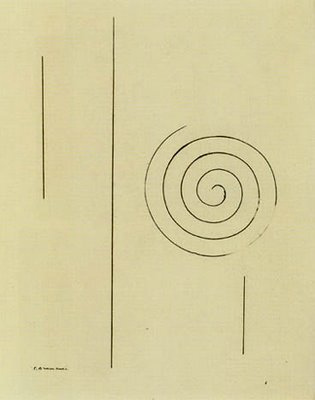 So Knowles developed a reading plan that would enable one to read the chapters of the Wake in order of difficulty, "starting with what was generally agreed to be the easiest material, moving to the intermediate level, and finally attacking the hardest chapter of all." Professor Knowles' graduate seminar using this reading plan also used four "gospels" to lead the way through the dark book and it was recommended to read the enigmatic text both during the daytime while sober and at night while under the influence of something "to bring the sounds of the text to life." whether Joyce would have known about Popeye, or King Kong, or the discovery of Pluto, or the teddy as an article of ladies' lingerie (yes to all four), or the Kit Kat Club, or Seabiscuit or the selling of Babe Ruth to finance the musical "No No Nanette" (maybe to all three), or Hell's Angels, or Tweety Bird, or the Kennedy assassination (no to all three). And I've found such things as the word "iSpace" in a sentence that looks like html text. In a book that was published in 1939. Joyce was really working on a whole different level. Coming up soon I'll have some posts taking a look at the many mind-blowing perspectives people have been applying to the Wake and what they have found (how it predicts the atomic bomb or "abnihilisation of the etym" in Nagasaki or "nogeysokey"; modern physics and the whole quantum movement; Twitter, Facebook, and other modern media) but for now, I've actually been putting my own Wake studies aside as I prepare for my second reading of Ulysses which will be fully documented here along with FAQs and a walkthrough for reading each chapter. I'm resisting Finnegans Wake at the moment because I know that once I fully dive into it (or back into it because I've already read a few books on it) I probably won't read anything else for years. Its infinite depths are just too fun to look at. Thank you. That is incredibly useful and I will follow that approach when I tackle the Wake. First I need to steel myself to Ulysses so I look forward to your walkthrough. Perhaps with the help of Nabokov and you I'll make it in one piece. Glad to help, Anthony, and thanks for reading and for linking to here on your blog. I love the title of it. Wow, this is amazing, thank you so much! I'm not ready to start reading FW yet but I'm bookmarking all the useful stuff I come across for when I do. DT : alternate suggestion: glance at the plot summary in Skeleton Key, have McHugh's Annotations and Glasheen's Census handy for the zingers, and just plow through. Don't expect to "get it" - just enjoy the word play and killer multi level, multi lingual punmanship. It's a great book, so just read it again later. DT - part 2 - I've read FW 2x now, and I'm prepping for a third go. I've read Ulysses 7 or 8 times. Just enjoy Joyce as the acute and sympathetic observer of his fellow humans, and be patient. These books do not yield up their treasures readily, but the the treasures are indeed there.